Project Description: We are proposing a project to study the impact of Rusty crayfish (Orconectes rusticus) on ecosystems in the upper Juniata River system in central Pennsylvania. We will quantify the threat on multiple fronts, and use our findings to justify further in-depth study on detailed ecosystem-level processes that are negatively impacted. We propose to proceed in the following manner. We will sample crayfish assemblages from across the watershed to begin establishing their distribution and then use this information for three main objectives of the overall research. First, we will examine morphological and genetic aspects of individuals in order to establish evidence for hybridization between rusty crayfish and the native Allegheny crayfish (0. obscurus). The findings will indicate how hybridization threatens native crayfish biodiversity in the Juniata, and what might be the implications in other Susquehanna River drainages where rusty crayfish occur. Secondly, we will quantify the diet of rusty crayfish and compare dietary overlap with young-of-the-year (YOY) smallmouth bass (Micropterus dolomieu). Rusty crayfish have been implicated in smallmouth bass recruitment problems in the broader Susquehanna basin, therefore this study will provide some of the first data on impacts on YOY life stages. We intend to expand this study with additional external funds, given our finding, to investigate ecosystem-level (functional) impacts of rusty crayfish by quantifying the difference in bioenergetic balances in smallmouth bass in streams with and without rusty crayfish. 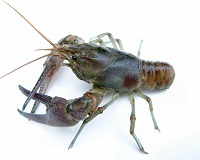 Essentially, what this research component addresses is how much energy is sequestered in rusty crayfish biomass and is not available for smallmouth bass growth and reproduction. Thirdly, with additional external funds, we will use our initial field surveys of crayfish to develop occupancy models in order to make predictions about streams at risk for invasion and to develop priorities for eradication efforts.